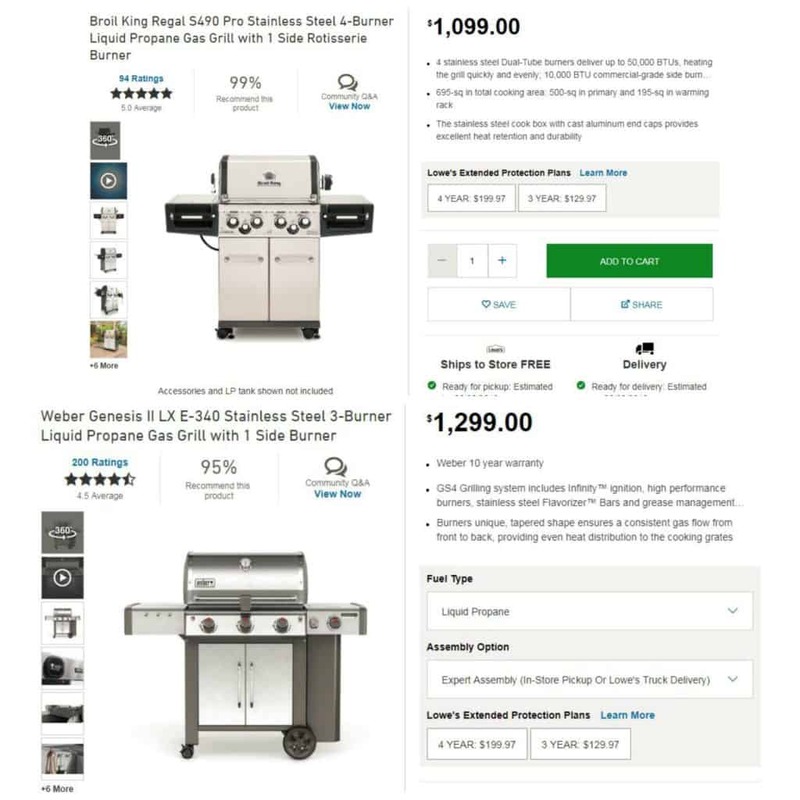 Broil King vs Weber: Regal or Genesis? 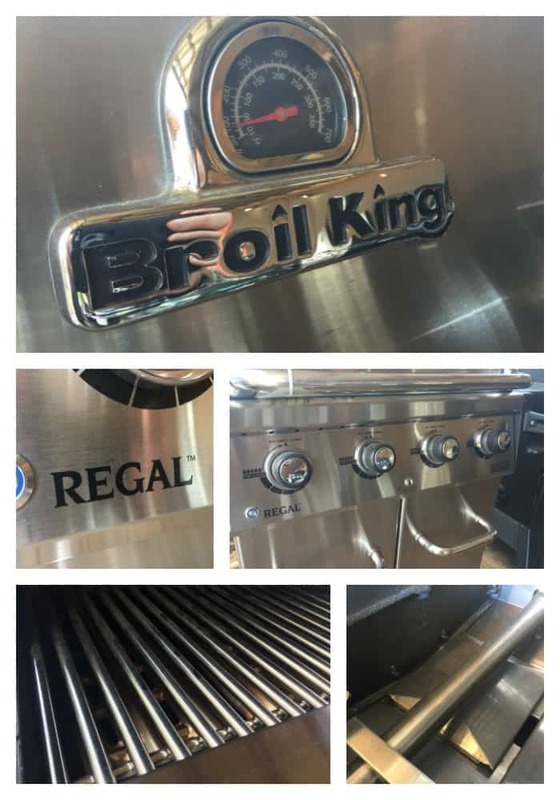 I put my hands on some Broil King grills the other day and liked what I saw. I was looking at the Broil King Regal S 420 and S 490 models and they are definitely high quality products. 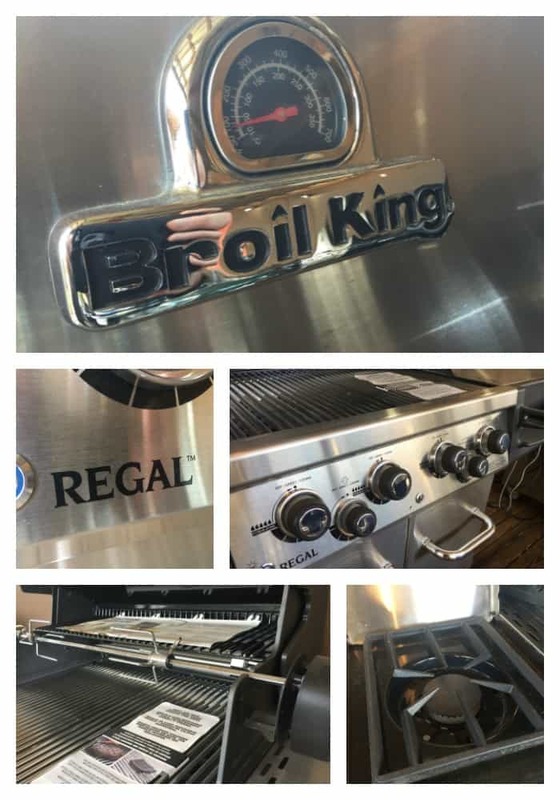 Broil King is a brand from Onward manufacturing and the drills are made in North America (Indiana, Tennessee and Ontario) with North American steel. Just like Napoleon grills, Broil King gas grills are legitimate challengers to Weber gas grills in terms of build quality and performance. 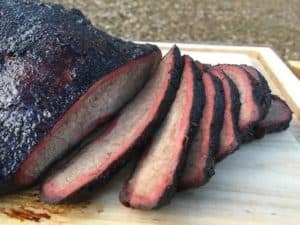 Lets do a Broil King vs Weber comparison by taking a look at the S 420 and S 490 and see how they stack up against their Weber equivalents. The Regal S 420 is a four burner gas grill with high end stainless steel construction. The 420 does not have a side burner or rotisserie burner. The best Head to Head comparison for the Regal S 420 is the Weber Genesis II S 310. They both have stainless steel bodies, grates and flame tamers and they also have equivalent primary grilling areas. 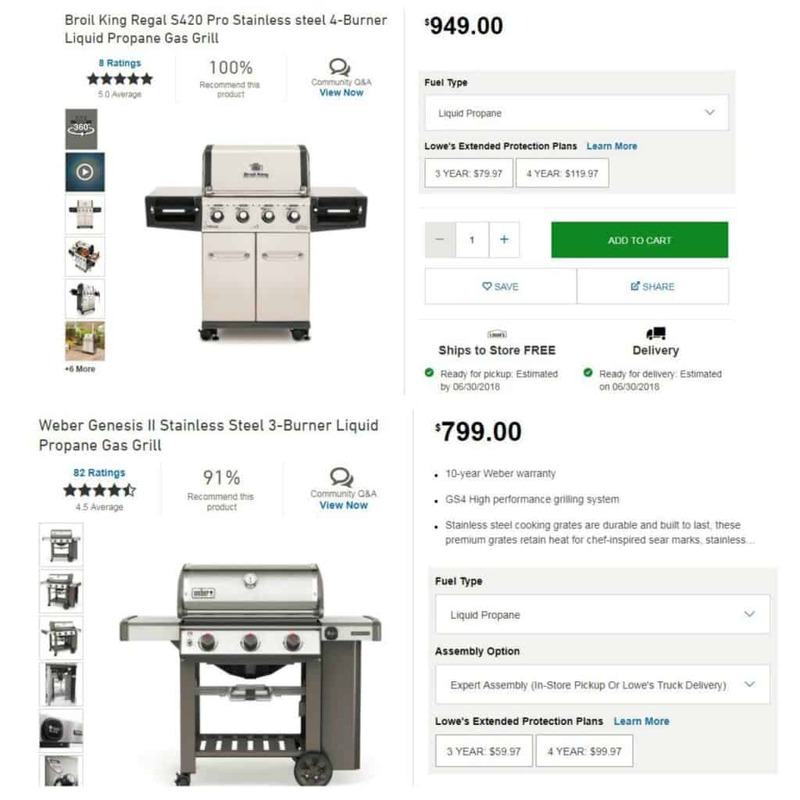 Lowes sells both of these grills so I grabbed a screen shot of how they compare. Heating Capacity: The Genesis II S 310 has three 12,500 BTU/hr burners for a combined heating capacity of 37,500 BTU/hr. The Regal S 420 has four 12,500 BTU/hr burners for a combined heating capacity of 50,000 BTU/hr. The 37,500 BTUs of the Genesis are used to heat 513 square inches of grate for a heating power of 73 BTU/hr per square inch of grilling surface. The 50,000 BTUs of the Regal are used to heat 500 square inches of grate for a heating power of 100 BTU/hr per square inch of grilling space. The Regal has the clear advantage when it comes to grilling power. Pitting the Regal 420 against a four burner Genesis does not change the game as the BTUs per square inch is pretty consistent across the Genesis product line. Warranty: The Weber warranty of 10 years on all primary components is better than the 5-10 year warranty from Broil King. That being said I wouldn’t worry too much about that. The 9mm stainless rods on the Regal are going to outlast the 7mm rods on the Genesis. Styling: I think the Genesis looks nicer than the Broil King but both are handsome grills. It is worth pointing out that the left side table of the Genesis folds down if you need a little extra space on your deck. The “Head to Head” battle between these two grills is a toss up. I look at the extra burner on the Broil King like the Sear Station that you get on a Summit 470. I think the Genesis is prettier and has the better price but the Broil King will do a better job searing steaks. The Regal S 490 is a four burner, stainless steel gas grill with a side and rotisserie burners. The bones of the Regal S 490 are the same as the S420. The 490 is upgraded with a side burner, rotisserie burner and a dedicated rotisserie burner. The best head to head comparison for the Regal S 490 from Weber is the Genesis II LX 340. The Genesis LX 340 has a side burner and the heating capacity of the primary burners has been slightly bumped up to 43,500 BTU/hr. There is a clear winner in this battle, the Broil King S 490. Rotisserie assembly with dedicated rotisserie burner. The Genesis LX 340 has a bunch of features that you don’t need (LED fuel gauge, lighted control knobs, etc) and is simply out powered by the Regal S 490. I was impressed with the Broil King grills that I got to examine. The build quality is solid and they have more “oomph” than their Weber counterparts. If you are in the market and can find a Regal at a good price then buying one would not be a bad decision.